Flaxen is a modifying gene that affects the manes and tails of chestnut horses, turning them a lighter color than the body. Some flaxen horses have silver-gray manes and tails instead of the more typical pale yellow or off-white shades of flaxen. This is thought to be caused by the sooty modifier acting on the flaxen hairs, effectively "dirtying" their color. Flaxen can "hide" on black based horses, as they do not have red manes and tails to show the effects of the modifier. They can pass flaxen on to their offspring. 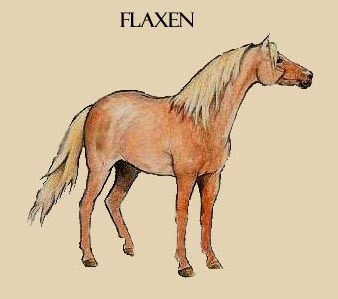 Not much is known about the inheritance of flaxen, but it is thought to be recessive, meaning it must come from each parent. There is no test for flaxen, so the determination of "flaxen" is made on visual assessment alone. 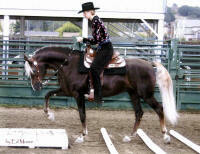 Light flaxen chestnut horses can be mistaken for palomino, and dark flaxen chestnut horses can be mistaken for sooty palomino or silver dapple. Knowledge of the bloodlines involved may help sort these out, and if there's any doubt, testing is available for both the cream dilution and the silver dilution to clarify things. 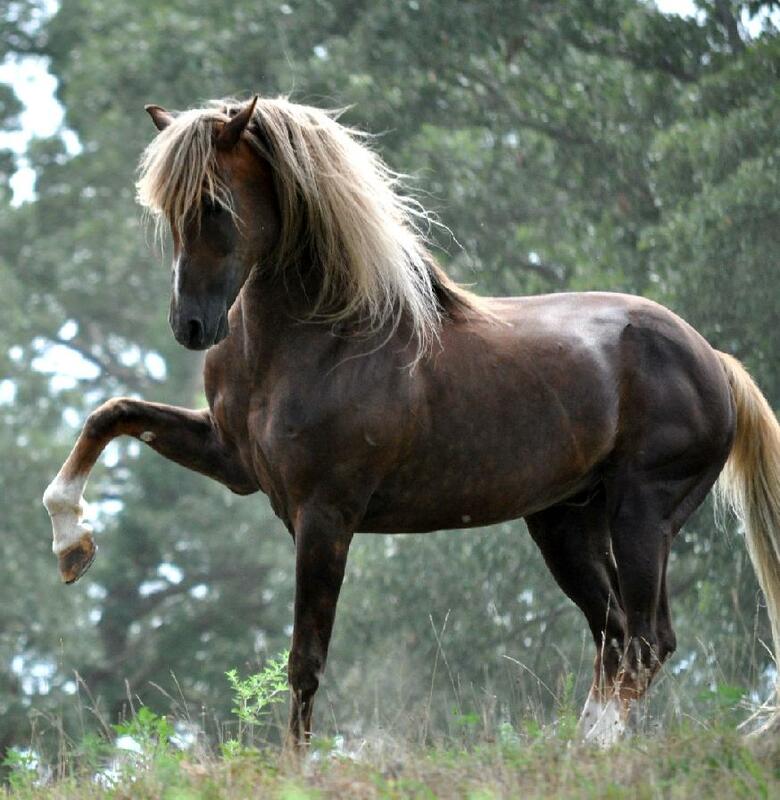 Flaxen is fairly widespread in the Morgan breed. Probably the most famous flaxens are those from Jubilee King lines, such as those bred by The Quietude Stud. 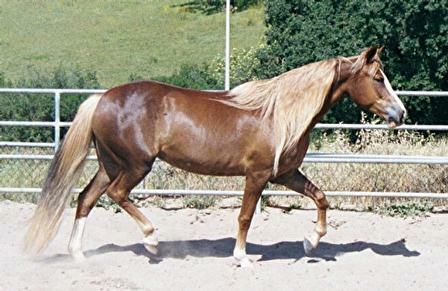 Other prolific flaxen lines include those from The Airacobra (and his son Beamington), Trophy, and old government lines such as the Devan horses and Fleetwing. 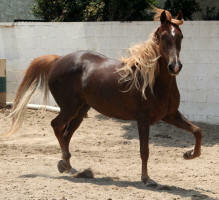 DO MORE JAZZ (Bridlesweet Donnie B x Westrek Sierra Madre) 2000 flaxen chestnut stallion owned by Silverado Ranch. 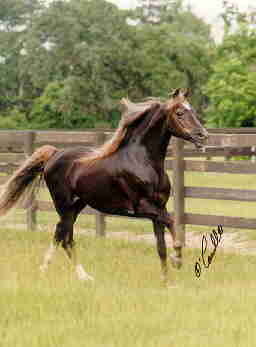 SILVERSHOE COLORADO MOAB (Mary-Mel's Indigo x Mile Hi Donsanea) 1996 flaxen chestnut gelding owned by Jim Suddarth, Missouri Morgans. Photo by Vali Suddarth. BATTERSEA ORLEAN (Caduceus Nicholas x Battersea Jolie) 1998 flaxen chestnut mare owned and ridden by Ric Walker. Pictured with them is the dark bay or brown mare NVS Mi Sonnetta (NVS Midas x Noble Ladylark) f. 2002, ridden by Jo Johnson. 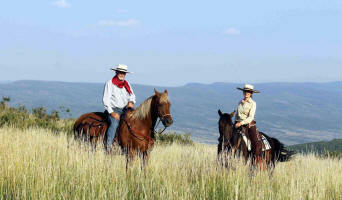 Photo taken August 2013, on a mountaintop trail ride overlooking the Yampa Valley of NW Colorado. CHANDLERCREEK CHANCEYGIRL (Thunder Michelangelo x FP Sunday Morning Coffee) 2008 flaxen chestnut mare owned by Karen Nolte, Chandler Creek Morgans. HYLEE'S GOING BIG TIME (Serenity Flight Time x Poincianna), 1991 flaxen chestnut gelding owned by Kim Jaeger. 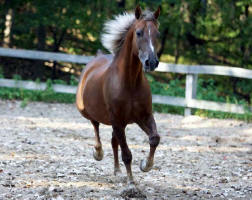 ELK CREEK HOT TAMALE (Herald Square x Burlington Farms Brandy), 2006 flaxen chestnut mare owned by Angie Riemersma. 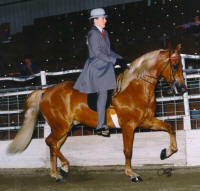 WINTERGREEN SHAMAN (HVK Santana x Wintergreen Token), 1999 flaxen chestnut stallion owned by Lauri Krause. 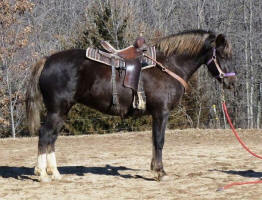 Shaman is a good example of a flaxen chestnut that could be mistaken for a silver dapple. Only a close examination of his pedigree, which is not from silver lines, and observation of subtle differences such as the red streak in his tail (typical of flaxens) and lack of darker leg points help to determine his actual color. 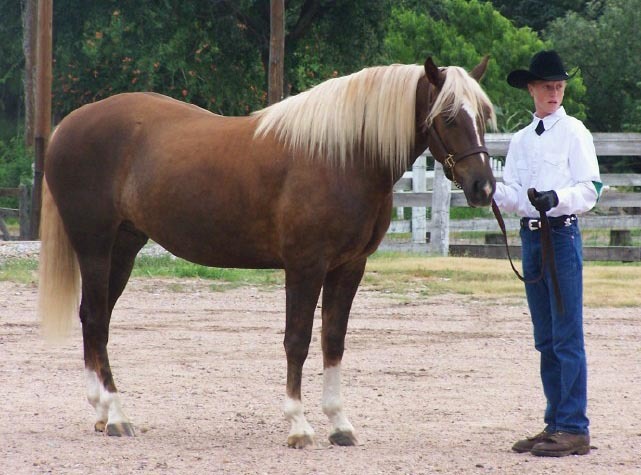 Blaine Janssen with his 2002 flaxen chestnut sabino gelding MOCOMO CHROME CLASSIC (Old Ways Bimbeau x Adiel's Yennah Babe). ROSERIDGE FOOL'S GOLD (HVK Warlock x Chandel Fortunaire), 1986 flaxen chestnut gelding owned by Lisa Bryant of Andover, KS. You can see how he got his name! Many light flaxen chestnut horses are good palomino mimics. 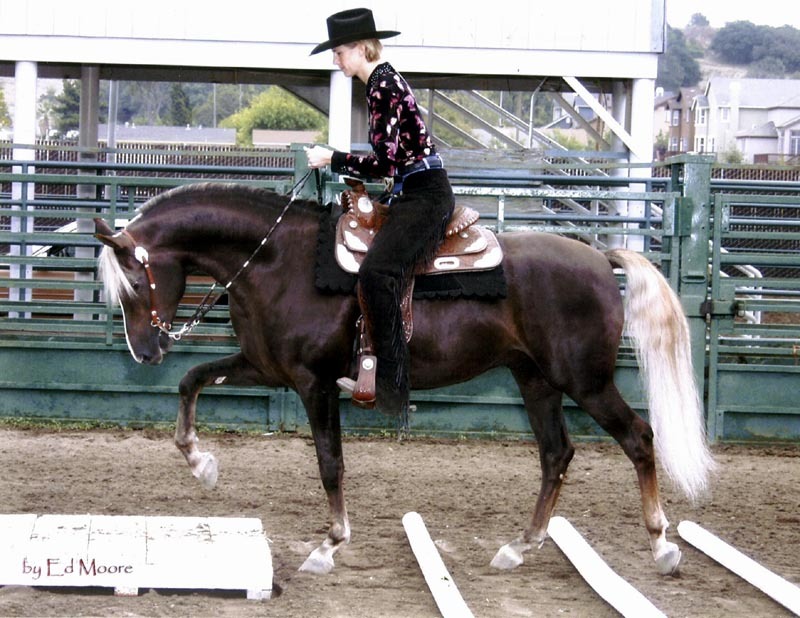 JAZZTIME SOCIETY PAGE (Shiloh Bold Command X Frosty Blue), 2003 flaxen chestnut mare owned by Nancy Jewel, Jazztime Morgans, WA. 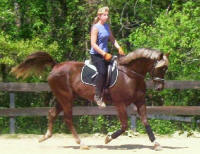 RUSTIC V'S LUCKY STRIKE (Maple Blaze X River Downs Pearl), 1996 flaxen chestnut gelding. Flaxen horses can have more flaxen in the mane than in the tail, and vice versa. 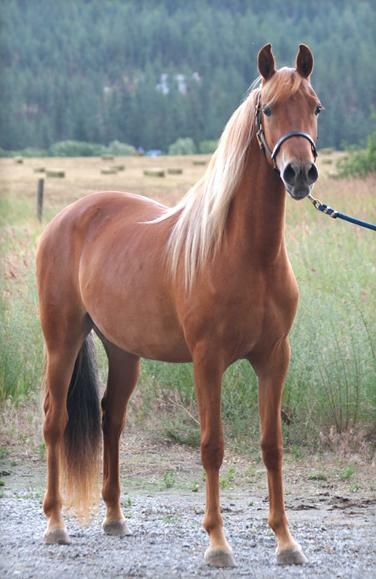 This gelding has a flaxen mane, but no obvious expression of flaxen at all in his tail. Photo courtesy of Ann Priddy. LSR TANQUERAY STERLING (LSR Canadian Whiskey X D Patricia), 1992 flaxen chestnut mare owned by Darrell Charlton; photo by Elaine Hickman. 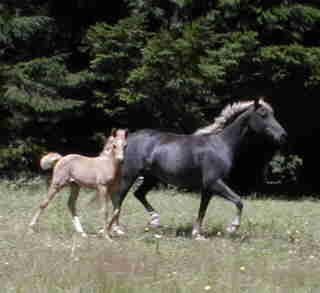 HEAVEN'S ANGEL (Dia H Major Boy X Heaven's Girl), 1990 flaxen black chestnut mare (was suspected silver dapple, but tested via UC Davis' Red Factor Test as a chestnut) and her 2000 palomino colt by Belfair Kruggerrand, COWLITZ VALLEY YUKON GOLD. Both horses owned by Lona Diemert, Packwood WA. 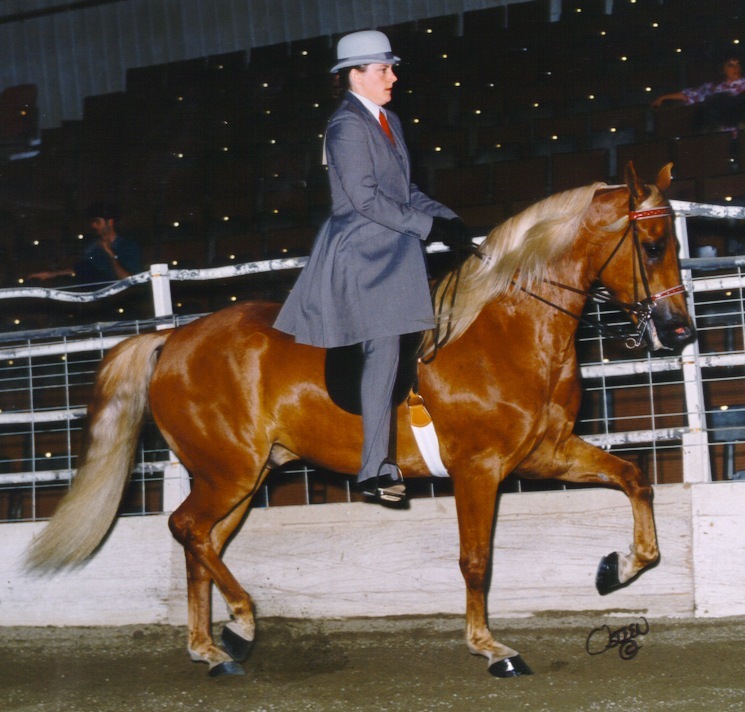 WHF WHISTLE JACKET (Beamington X UC Duchess), 1982 flaxen liver chestnut stallion owned by Jane Lea Hicks, Conroe TX. I am often asked about this stallion being a possible silver dapple, but he is not. Flaxen liver chestnuts can look similar to some silver dapples, but genetically a silver dapple has a black or bay base coat, not a chestnut one. Base coat color can be scientifically proven with a simple DNA test called the Red Factor test.